First week of term, hot weather, committee meetings, swimming lessons, work, craft group meetings. Totally crazy week to decide to do a culinary trip round the world. We did it though. And thoroughly enjoyed it. Unfortunately, it’s taken until today to catch up on blogging about it. First Born has placed French food in second place, Vietnam remains in first. High praise indeed and I’m betting the large amounts of cream and butter involved had plenty to do with it. For now, the trip will continue but on a weekly basis, not every night. Next week, we visit Tonga, First Born having rejected Niger for the moment. Now to the food! Recipes from Complete Techniques, Jacques Pepin. Place carrots in a saucepan and cover with water. Bring to the boil, add salt and simmer until tender. 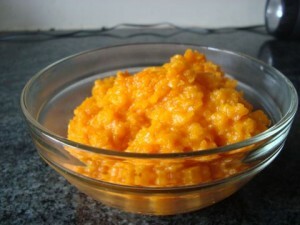 Place in cheesecloth or a fine sieve and drain for 2 hours to allow excess moisture to drain. Lift and press to remove any remaining moisture. Return to saucepan. Add cream, butter, salt and pepper. Heat slowly and serve hot. Making puff pastry in 36 degrees weather is an act of insanity. With frequent refrigeration, it is possible. Just. 6 small zucchini, sliced into thin strips. Roll out puff pastry to about 1/2 cm thick. Cut 4 strips which are 10cm x 4cm. Brush with eggwash and score the top. Bring the zucchini, water and a dash of salt to boil in a frypan for 1 minute. Add butter, lemon juice, salt and pepper and bring back to the boil, shaking the pan so the water and butter combine. Warm the puff pastry in the oven and cut into halves, lengthways. 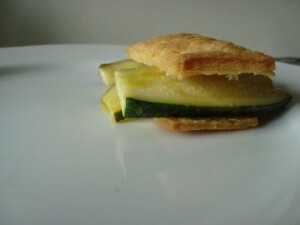 Arrange some zucchini strips along the bottom half od each and moisten with butter sauce. Cover with top part of pastry and serve hot, immediately. Make a large slit through the middle of the chop to create a pocket. Flatten with a meat tenderiser o make the flaps of the pocket as big as possible. Melt butter in a small saucepan, add leek and saute 1 minute. Add celery and saute for a few more seconds. Mix in spinach with a fork and cook for 1 minute more. Add ham and seonsing, combine and remove from heat. Allow stuffing to cool. Push cooled stuffing into pockets in chops. Season chop. Melt 1 tablespoon butter in a large frypan. Add chops and cook on medium heat for 5 minutes on the first side. Turn and cook for 6 – 8 minutes. Cook slowly to avoid drying out meat. 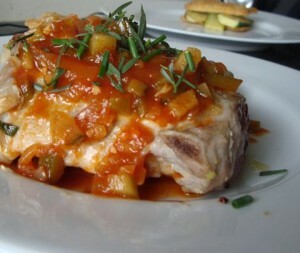 Keep chops warm on a platter in a slow oven while you make the sauce. Add onions to pan chops were in and saute for 1 – 2 minutes. Add wine. Boil and stir for a few seconds. Add tomatoes and garlic and cook for 1 minute, add demi-glace, bring to a boil and reduce for 2 – 3 minutes. Season if necessary. Stir in cornichons. Taste and season. Pour over chps and garnish with herbs.